As most of you well know, we North Americans are facing a Winter unlike any seen in decades. With severe drought in the West and Arctic cold, record snows, and ice storms to the East, you’re either praying for rain or cursing the cold. Whether this Winter is truly one for the record books remains to be seen but it sure is a great excuse for making comfort food. These past few weeks, I’ve said good-bye to any thoughts of post-holiday dieting and broke out the Dutch oven and stock pot. I’ve made soups, tomato sauce, chili, stew, braised short ribs, baked pastas, and pulled pork. Not only that, I’ve baked more bread these past few weeks than I have in ages. In short, I’ve done all that I can to warm both me and my kitchen which, for reasons known only to my home’s previous owner, has no heating element other than the oven. Heaven bless that oven. Since you really cannot make beef stew for one, soup by the bowl, or pulled pork for a single sandwich, you can well imagine that my fridge and freezer have been well-stocked with leftovers, not that there’s anything wrong with that. Even so, after my third dinner of beef stew or fourth lunch of a bowl of chili, and with temps still in negative territory, I began to crave something different and searched for some long-forgotten comfort food recipes. Enter tuna noodle casserole. Before going any further, I need to mention this recipe’s origins. 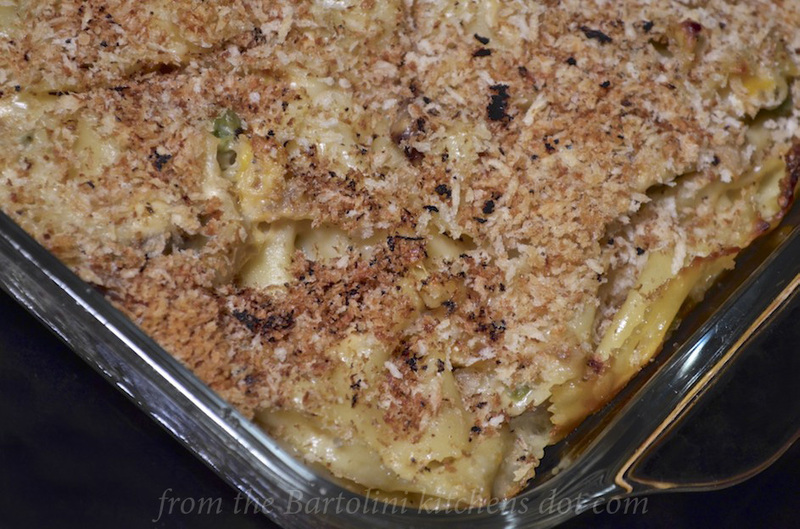 After all, I did call today’s post “Mom’s Tuna Noodle Casserole”. Although there is no direct link to Mom, I think there’s plenty of evidence to support my claim. First off, I found it in the oldest recipe file that I own, one that I created on my first PC back in the 90’s. That file has survived a short-circuited motherboard, head crash, my conversion to Apple, and a transfer to my second iMac. Though forgotten until now, it contains a few gems from Mom but, I admit, this bit of evidence is highly circumstantial. Perhaps the most convincing evidence can be found within the recipe itself. Although all the ingredients are listed, the amounts required for some of them are missing. 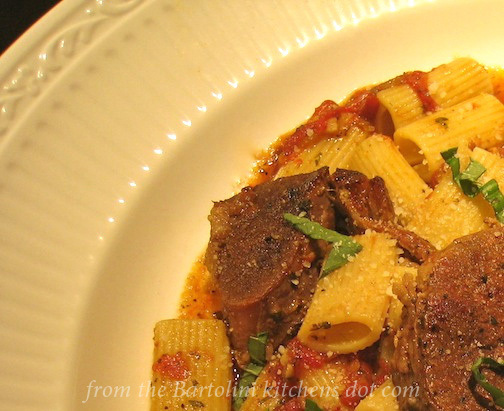 This is a hallmark of the Bartolini family recipes and a major reason for this blog being created. I could only be more certain of this recipe’s provenance if an amount or two was listed as “a handful of” this or “a good pinch of” that. Members of the jury, there is no doubt in my mind that this is Mom’s recipe. I rest my case. Now, a word of warning. This is an old recipe and some may not appreciate it. First of all, it contains mayonnaise and there are those who cannot abide the stuff. I don’t like cilantro, so, I’d say we’re even. It, also, contains a can of condensed soup, the bane of many a modern-day foodie. Well, I’m guessing this recipe comes from the 60’s and we didn’t have foodies back then. We had gourmands — and the Galloping Gourmet but never mind him. Lastly, the final two ingredients, though optional, are listed as frozen. In this part of the continent, when it’s casserole season, there are few, if any, fresh peas to be found, and, for those of us living in the Corn Belt, buying what passes for corn in the off-season is sacrilege. If, however, you’ve access to tasty, fresh peas and sweet corn in Winter, by all means use them instead of frozen. In a large mixing bowl, combine cooked noodles, tuna, cheddar cheese, corn, and peas. Sauté onions and mushrooms in a little olive oil until onions are translucent. Add to the mixing bowl and stir to combine. In a medium saucepan over medium heat, combine the milk, soup, and cream cheese, stirring until hot and well-mixed. Add to the mixing bowl and stir to combine again. Meanwhile, melt the butter in a sauté pan over medium heat. Add the bread crumbs and toast until golden brown. Immediately remove from heat. Pour the tuna mixture into the baking dish, top with the toasted bread crumbs, and cover with aluminum foil. Bake, covered, for 45 minutes before removing the foil. Bake another 10 to 15 minutes to further crisp the topping. Allow to sit at least 5 minutes before serving. The amounts for some of the ingredients will depend upon the volume of noodles you’ve prepared. I’ve found that if I use a full pound (450 g) of noodles, for example, a single large can of tuna fish may not be enough. You’ll find that the “cream sauce” is rather thick and can overpower the rest of the ingredients. More tuna is needed to compensate. Be sure to brown the bread crumbs before sprinkling them atop the casserole. If you rely on the oven to fully brown them, you’ll run the risk of drying out the casserole. Any broad noodle may be used here, though shorter ones work best. I happened to have a bag of farfalle, butterflies, and used it. I think you could easily substitute chopped, roasted chicken in place of the tuna. One common theme running throughout this blog is my love of pasta. I’ve certainly made no effort to hide it. With temperatures so terribly frigid, today’s Blast from the Past is particularly welcome in my kitchen, for it involves both a lengthy braise in the oven and a large pot of boiling pasta water on the stove top. Combined, they are just what’s needed to warm my kitchen and keep it that way well into the evening. Best of all, I end up with a great pasta for dinner. 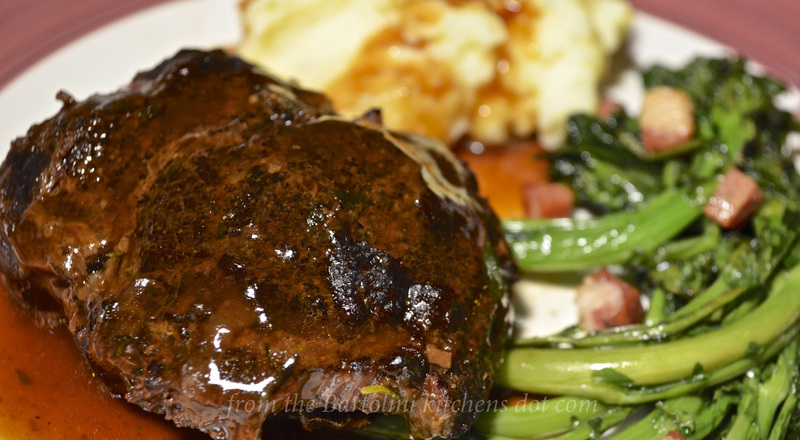 You can learn how to prepare Steak Pizzaiola by clicking HERE. This entry was posted in Family Recipes, Main Course (Secondi), Pasta/Rice/Soups (Primi Piatti) and tagged Cooking, family recipes, Food, Italian, Recipes, Tuna by ChgoJohn. Bookmark the permalink. The weather the world over is all haywire John. Mother nature is sure irate with us all. There is something about the era of using tinned creamed soups and mayonnaise. I wonder why they were so popular? Mom’s casserole is most definitely comfort food – fabulous! Have a super day and stay warm. Oh, you got me hooked at “mayonnaise”. I love it, and this seems to be a wonderful casserole. Never mind frozen veggies, I’m an unorthodox foodie 😀 I have to convince my husband though, to mix tuna and mushrooms… Gosh, now I’m hungry! I have a very similar recipe that originates from my Mum. You can no longer buy condensed mushroom or celery soup here, so it’s been relegated to the past. Sad really because it tasted so good! Oo it seems I’m wrong. My brother said he can still buy mushroom and celery at his local large supermarket! Maybe I’ll have to resurrect that old recipe after all. Thanks, Giovanna. We never had anything seasoned with cilantro growing up and I never grew accustomed to it. have been experimenting, however, using it when I cook. I’m not ready for it raw, though. Not yet! Tuna noodle casseroles are the best! Aren’t they though? Why ever did they fall out of “fashion.” You never see or hear of them anymore. I’d forgotten all about Mom’s. Big mistake on my part. That said, this sounds so awesome in the cold, nasty winter…all warm and filling! Truly Comfort Food! I saw that episode, Marie. I’m not one for a Green Bean Casserole to begin with but to go through all that, on Thanksgiving? It is not going to happen. I’ll open a can of soup and have a martini during the time I save. I made this during the last cold snap and it sure was good. It sure won’t be years before I make it again. I look outside and see sunshine and think of all of you hip deep in snow. My heart goes out to you. I would love your mother’s tuna noodle casserole. It’s much like one my grandmother made. It’s something to see how many commenters have memories of casseroles similar to this one. I wonder why it is so rarely made today? Oh thank you to your Mom, (and to you for the reprise) this sounds so very, well, unctuous – just the food for expanding waist lines and fending off the cold. Oh oh… I find it a funny way to cook a Noodle Casserole! But of course it dipends on my being Italian and living in Italy… Anyway i find your Tuna one special and tasty. I would have been surprised, Silva, if you knew of this dish. It is very American and was popular 50 years ago. Today, it is rarely prepared. Our tastes have changed. It’s true. Sometimes I think to be the only one who still cooks dishes my grandmother prepared! People prefer modern cooking: tasted have changed. This looks like a true winter classic. We used to have a very similar casserole growing up. My mom put crushed Cheez-Itz crackers on top. I have several recipes using condensed soups too that I have toyed with trying to recreate. For some reason my Grandma used cream of mushroom soup in her beef stroganoff, ah but the memories of her homemade egg noodles that she made with it are so yummy! Must look into this, though for now it is warming here, mid 70s today. Of course that doesn’t mean much, it could be snow again next week at the rate we are going! Thanks for a great story and yummy recipe. Thanks, Marianne. I’ve not made this casserole in years and it sure was nice to resurrect it. It was perfect for those frigid days. This looks wonderful John. I love the idea of both the chicken and tuna versions… delicious!!! It’s been a very long time since I’ve made a tuna noodle casserole but both Aaron and I were actually talking about making one yesterday. We ate them as children and loved every bite 🙂 I think your post is a confirmation of our desire to revisit the recipe… I will try the Bartolini version, it looks wonderful. Had me chuckling at “…we didn’t have foodies back then…” Food does describe our society and culture, doesn’t it…quite like language in an edible form. It tells a story of necessity and luxury. The tunafish casserole sounds like the perfect thing for winter and I can just about taste it…I think I may have had something quite similar back in the day when I was a kid. Yes, food has become a language all its own. I think the internet has played a large role in that, too. So many have said that this dish reminds them of a casserole they enjoyed in their youth. I wonder why it fell out of favor. I rarely hear it mentioned anymore. No matter. I’m just glad I found it again. It sure was a warming meal on those cold nights. I’ve just sent this link to a north American friend living in exile in London and she’s demanding that I cook it for her – apparently her mom used to make one very similar. It looks like the ultimate comfort food! One quick query please – how much Cheddar do you use and do you add it to the noodles at the start or to the mushroom soup etc? The recipe says both. Thanks for sharing. Hello, Linda. Thank you for catching my error. Add the cheddar cheese to the noodles. I’ve deleted the 2nd reference. (I am the world’s worst proof reader.) I added about a half cup of cheddar, maybe a little more. When I made it this last time, I cooked 500g of noodles and used 1 large can of tuna fish. Next time, for that amount of noodles, I’ll use 2 cans. I wanted more tuna in the dish than what I had. I hope this helps and that your friend likes it. Good luck! She’s almost on her knees begging! Thanks for clarifying that – hope you didn’t mind me asking. All the best, Linda. Mind? I’m truly grateful, Linda. I’d hate for someone to prepare the dish badly because of an error on my part. Thanks again. We love tuna noodle casserole around here. I have never put cream cheese in it. Must try this. It is a comfort food under the harsh conditions of winter. This winter is just too much — and we’re south of you! It rained all day today and now they’re saying the Vortex will return next week. I need to find yet another casserole recipe. Oh yes, the snow. I posted photos of my snow on Monday, but we had more on Tuesday so you can imagine how the snow banks have grown. Sad to say I never had a tuna casserole. Yours look comforting though and we sure need lots of comfort food to get us through this winter. So looking forward to spring. We’ve had more snow, too, Norma. It rained all day today but now the temperatures are dropping again. Today the forecaster said the Vortex could return next week. I don’t believe it! Enough already! Hurry up and get here, Spring! I think yo’d like beef cheeks. Very tasty. I know I’d love a bowl of your chowder and split pea. I love a thicker soup when it’s dreadful outside. And it has been dreadful outside. Never had a tuna noodle casserole, the mayo would have to be substituted by something else, as mayo doesn’t enter our premises 😉 Both Phil and I detest the thing with a passion…. now, pass me all your cilantro, will you? My dear friend, your words always take me back, to a simpler yet happy time. Tuna casserole is definitely a ‘Mom dish’ but not my dear Mom! JTs dear sweet Mom! I hadn’t ever tried it until I met JT. She too used canned soup (either cream of mushroom or celery) but her difference was to crumble potato chips on top instead of bread crumbs! You can imagine what a ‘treat’ I thought that was? Potato chips on dinner? Quite unheard of in my family. I haven’t made it in years, must give it a go again for old times sake. Good old Galloping Gourmet, another fond memory, thank you. We’ve been getting a lot of very chilly days too but we’ve also been getting way too much snow, record breaking as you mentioned. We don’t have space to shovel it anymore. Oh how I long for summer. Wasn’t that Graham Kerr something? I was too young to actually cook anything but he sure did have a good time doing it. Today was a warm one and it rained all day. There was even thunder. Now, though, the temps are falling and the winds are strong. There’s going to be a lot of ice to deal with in the morning. Worse yet, today they started forecasting a return of the Vortex next week. This is one Winter none of us will quickly forget. Yes indeed it was Graham Kerr, I still remember watching him! I guess that was the first reality TV too, didn’t he cook in front of a live audience and always invited one lady up to dine with him at the end of the show? Today’s weather is alarming indeed, I’m just about to head out to shovel the snow away from the house so we avoid any flooding, although the house has been pretty good up until now, I would just hate the bother. Yes, Graham and his dinner guest, plucked from obscurity in the audience. Ha! What a thrill and nerve-wracking experience all rolled into one. Your smart to pull the snow away from your home. An ounce of prevention … Although we got some rain and ice, it was not as bad as had been threatened — at least not here. It’s a good thing, too, because flooding along the rivers is a real concern. With the ground still frozen, any rain just runs off into the streams and rivers. As much as I’d love to see Spring get here, I hope it’s arrival is gradual. Let the snow melt slowly and keep the flooding to a minimum. Fingers crossed. Sounds wonderful! My childhood comfort casseroles all contain a can of Campbelll’s “something” – your recipe and story bring back a flood of good memories. You pushed me to pull out one of my old favorites – thank you! You are so welcome, Nancy. What would our Mothers have done without Campbell’s condensed soups? I bet every pantry in America once had at least 1 can of condensed soup on a shelf. Those old recipes are great, too. I wouldn’t make them every week but, once in a while, they sure do hit the spot. I have a chicken recipe that uses a tin of condensed tomato soup. Those that don’t know love the recipe and those that hear the ingredients turn their nose up at the mention of the can of soup. I wouldn’t change the inclusion of the soup because it is what makes it. It is one of our favourites. Your recipe sounds delicious and more importantly one of those recipes where if its freezing outside you probably have all the ingredients anyway. Will be giving it a go. BTW we love that Burrata so much I am waiting for another delivery this afternoon! which is all down to you. Thanks, Maria. There was a reason these casseroles were so popular and it’s because they all tasted so good. Those cans of soup played a big role in creating that flavor. You’re right, too. It is a “pantry dish” because most of us have the ingredients in our pantries. And few will warm you better when it’s so cold outside. That Burrata really is something, isn’t it? It’s such a treat! Hey, Celi! I’d be surprised if Sandy doesn’t have her own recipe for this casserole. It sure was popular back in the day and I bet she has at least one can of condensed soup in her pantry. Mom always had a couple. The rain has stopped but the winds have arrived. The temps are dropping, too. Tomorrow will be another good day to stay indoors, at least until they get the roads salted. The commuters will have a rough go of it until then. Howdy, Barb! This does have that vibe, doesn’t it? Seeing it rest on the countertop was a trip back in time to Mom’s kitchen. I’m glad I found the recipe. I won’t make it often but I won’t forget it for years again, either. It’s the perfect meal for a wintry day. I hope you did make a tuna casserole, Barb, whether it was this one or your own, and enjoyed it as much as I did. Comfort food at its best! This does sound like an old school casserole. This is exactly the kind of dish that I’d find in my grandmas’ kitchens. In fact, my one grandma still makes these types of dishes to this day! These types of comfort dishes were also passed down to my mom, because I know I ate something similar growing up! This looks very delicious and comforting. Mr. N and I would no doubt enjoy it. Mike won’t touch tuna though – except in sushi. Miss A hasn’t appeared to be much of a fan either, but I’ll make tuna melts on the occasional night Mike isn’t home and Mr. N and I gobble them up. 🙂 (Miss A rarely eats a sit down meal anyway.) Sadly though I’m back on my post holiday diet. With all this cold weather, I too have spent the last few weeks eating lots of bread and pastas. It’s just so warming. The only downside…my jeans took notice and not in a good way! How perfect a meal for this weather John. I’ve been cooking comfort foods for over a month now, not trying anything new, just the old standby’s. Do you sometimes wonder how we survived the 50’s & 60’s? Although I’m much more conscious of getting healthy food on the table I had to admit that when I grab a can of tomato soup to make a quick American Chop Suey…well I just don’t feel all that guilty. I’m pretty sure my mother went through all those casseroles that had the canned soups because of all of the Better Homes & Gardens, Women’s Day, Betty Crocker, etc. magazines geared for the stay at home mom. Campbell’s soups used to run tons of contests for new recipe ideas – I think I still have one of their annual winner’s books. Now the Galloping Gourmet – what a character he was! You’re right, Diane. This dish is perfect for this weather. It’s warm, dills you up and, is a nice reminder of days gone by. Like your Mom, mine pulled recipes from everywhere. Without the internet, she and the neighbors traded recipes like we send emails. And condensed soups played a big role. I’ve no problem with them but I rarely have need for them now. Still, like this tuna casserole, when a recipe needs one, I’ll add it without a problem. There’s a reason those dishes were so popular: they tasted good! Three weeks of non stop rain, I’d eat just about any comfort food! I don’t think I would make this but if someone else did I have a feeling I would eat it! Sunny and warm here in Italy! 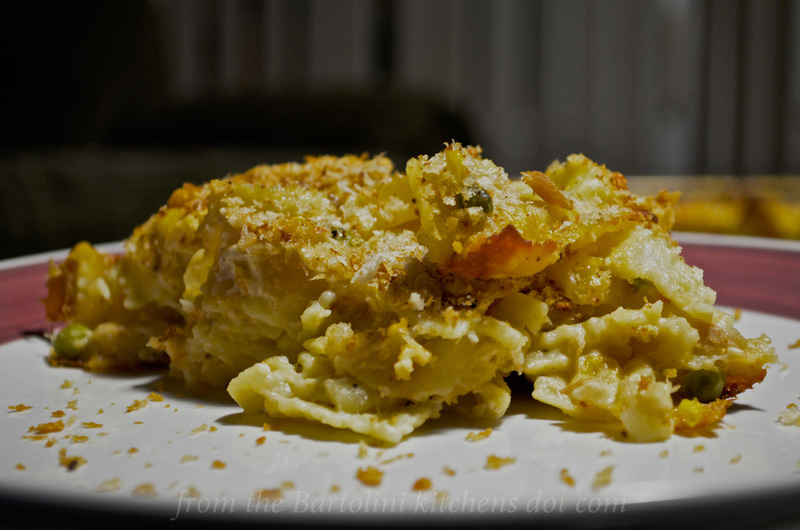 Never tried a tuna noodle casserole…sure a very comfort food in your freezing days! Your mom was trying to kill you with that heart-attack tuna casserole. She loves you so much and wants you with her. Be careful with those “beef cheeks”. There was a massive recall of 8M#s of beef in the Illinois area. Tongues, etc. were also part of that recall. The beef came from California. The beef cheeks were bought from a certified organic farmer at the Evanston farmers market, the last week it was open. I buy my chickens from him, too. I’m not the least bit worried about any of it. Thanks for letting others know of the potential problem, Donna. Thanks, Betsy. I think a major component of any successful comfort food is the nostalgia quotient. It’s not enough that it fills and warms you, it has to remind you of your youth or of good times past. If you don’t follow the the family recipe, you might mess up the nostalgia and that’s not good! So, yes, bring on the mayo, the soup, the peas, and corn and I’ll be grinning from ear to ear. This is one of those blasts from the past that I so love! I sometimes make my mother’s tuna noodle casserole, which shares the same bones as your mother’s: the can of soup, peas, etc. But no cream cheese or mayo in mine, and usually no cheddar either. I’ll definitely have to give this a try — it’s a fun recipe! And I know the flavor is just the right thing for this miserable weather we’ve been having. Thanks for this. Thank you, John. This recipe really struck a chord with many. Why did it ever fall out of favor? Granted, it may not be the heart-healthiest of dishes but no one would eat it everyday. For me, it was perfect when we had those sub-zero daily highs and I pray I won’t need to make it again this season. If I do, I’ll probably have to change the ingredients to take my tears into account. I want winter to go away. Enough already!!! This is a wonderful recipe, and I’m sure it was your mom’s. I used to make tuna casserole for my kids when they were little, and haven’t made it now in years. This will be on my weekend to cook list! They are going to be so surprised when I show up at their door with this! Ha! When the e-mail heralding your latest post dropped into the in-box, I glanced at the title, laughed, and said to E.g., “Chicago’s really feeling the winter. Chicago John’s latest recipe is his mum’s tuna noodle casserole. Talk about comfort food!” Then I read your post. Are we kindred spirits, or what? My siblings and I were born between 1955 and 1963, and tunafish casserole was a staple supper item. Our mum’s version was made with leftover rice, and without cheese, but yes to the mushroom soup, buttered crumb topping, and plenty of frozen peas. Thanks for the blast from the past! I’ve really enjoyed reading these comments. So many have experiences similar to yours, of Mum or Grandma fixing casseroles similar to this one. Each has their own twist but the dish is basically the same: noodles, tuna, creamy sauce, vegetables, and a crispy top. Thank heavens for comfort foods! I definitely smile whenever I think of the Galloping Gourmet! I can’t remember his name, but I can still see his smile and hear his voice. We made fresh pasta on our weekend getaway, and I had such a good time and I shared about your wonderful blog, John. We made pappardelle, and they were probably just a little thick for Italian pasta, but we thought how good they would be in tuna casserole. And then, we discussed our love for tuna casserole–like our mother’s made–with all the condensed soup and certainly not a care in the world about calories or cholesterol. My husband would be thrilled for me to make this soon. His mom, gone for a long time now, never wrote out her recipes. She was a simple cook, but he misses her “specialties” and I think this would really satisfy. Thank you so much, Debra. When I first approached Zia about starting a blog, we doubted whether even our family would read it. Both of us are amazed that so many, from all 4 corners of the world, prepare our family recipes. I wanted these recipes preserved and used and, by golly, they are! I am so glad that you had a successful first attempt making pasta. The thickness of the noodles is really a matter of personal choice. i like mine a little thinner than does Zia. The only way you’ll know what is best for you is to make it and experiment. And the more often you make pasta, the easier and quicker it becomes. One thing, though. Promise me that one day you’ll use homemade pasta to make your favorite lasagna. It will be unlike any lasagna you’ve ever had. Guaranteed! Thinking back, I would suspect that the Grahame Kerr recipe books would have used items like tins of soup or at least consommé back in the 1960s. I thought that tuna casserole was pretty much an American creation and have been surprised when a few other countries have chimed in. Even so, all speak of it in the past tense. No one has yet admitted to making it now and this is the first I’ve made it in years. I remember watching the Galloping Gourmet with my grandmother in the late 60s. I don’t think he would have used condensed soup on TV, but it might have been used in the recipe books because it was normal at that time. Grahame Kerr became very health conscious in the 70s (when his wife became ill) and cut back on all fatty foods in his recipes. Yes, I even bought one of his “health” cookbooks during the Summer of my Discontent. I went vegetarian for 6 months. Quelle horreur! There’s something very nostalgic and comforting about recipes like these – and we could be all trendy and call them “vintage”! I love cilantro and tuna…and pasta and anything creamy so I think with the dreaful weather we’re having here (floods and gales over this direction) it might be a good one to make to banish the winter blues. My pal used to make a chicken bake which used dried apricots and a packet of onion soup – I know it’s not remotely like your recipe but it made me think of it nostalgically! Unlike other recipes you’ve posted before. Don’t think I’ve ever tasted anything like it before. I would have been surprised, Stefan, if you had seen/heard of this dish. it is very American and went out of style some time ago. When we started eating healthier, casseroles like this one were left behind. More than a recipe, this, for me, was a trip down Memory Lane. Way to go, Fae! Chopped roasted chicken would work very well. I hope you o make and enjoy this casserole from my youth. Oh dear John, I am in trouble here. I don’t do peas OR mayonnaise but I do like the sound of your recipe. I used to make, many, many years ago, a macaroni cheese to which I used to add tinned fish and corn kernels. It has the same comforting feel to it as your dish. Adding the tinned soup is really a blast from the past. What fun. I know I am a gourmand and definitely not a foodie. But I love cilantro and I love mayo. Not sure where that puts me. Chicago has had horrible weather which makes my brother wonder why he ever stayed. We had 60 today in Denver but at the moment it is thundering and raining cats and dogs. go figure. I’m in need of tuna casserole! Do you know my mother never made it? Ever! So I never have either. That is going to change! When I worked behind the bar, I often met people who had just moved into Chicago. If they moved here in April, May, or June, they were here to stay. If they moved in October, November, or December, they’d be gone soon, sometimes in weeks. This city’s best asset is its Summers. The promise of a great Summer makes our Winters bearable. Although this Winter is testing that hypothesis. The Summer of 2014 had better be fantastic! We never had this at my family home when I was a kid, sadly, but I made it in my own home in the early years – it was cheap and simple. I still have an affection for it and use a similar recipe… and still have tin of condensed cream of mushroom soup in the cupboard at Taylors Arm on standby. I said in an earlier comment that there was a time here in America where I bet every pantry had at least one can of condensed soup on a shelf. Mom’s always had a couple. Love a good tuna casserole John, though it’s been years since I cooked one! It too had a can of soup added to it (cream of asparagus!) and tinned corn as well… Brings back great memories! And I’m all about the ingredients/flavors in this casserole and the toasted bread crumbs look perfect. Hurray ! I’ve been looking for this recipe for years! This was so popular when I was growing up, although my mother couldn’t prepare it for my father – who was strictly “meat & potatoes’. Back then a can of tuna could make sandwiches for 4 – 5 people – so I can see why you mentioned ‘upping’ the amount of tuna if a lot of noodles are involved. I can’t wait to make this – thanks John! PS – the other recipes look amazing as well !! You’re such a sweetheart. Thanks, Cecile. Coming towards the end of a blog break I have been reading the recipe and all the comments and having a very comfortable laugh!! With hardly any sleep under my belt over the past fortnight, may I be a horrid copycat and agree with Sally [no mayo in this house either, nor tinned soups or cream in my case 🙂 !] and I do have to grin alongside Stefan!!!! Amazing how many times mothers and grandmothers are mentioned!! And, oh boy, I thought Graham Kerr was a Brit but one of ours ~ do remember watching him when somewhat younger 🙂 !!! Since I am fervently trying to avoid a heart attack, am looking forwards to the ever fashionable beef cheeks next week 😀 ! I had a feeling, Eha, that you and this recipe would not agree. This casserole was very popular here, back in the 60’s. Of course, few knew anything about salt content, fat, or cholesterol. I bet my Mom viewed recipes like this as a break in the monotony of cooking Italian every day. She could get dinner on the table relatively easily and quickly. It is rarely made now, for people, like yourself, are far more educated about the foods they eat. Oh but John, I ‘disagree’ with a big smile! Altho’ dishes like this and mac’and’cheese are somewhat ‘American’ as we know it now compared to us, I do remember reading recipes like that on the back of some soup tin at the supermarket: just did not make them even then – forgive me when I admit that most tinned soups I have tasted have had an artificial tang and far too much salt even when I was a total novice to cooking 🙂 ! And certainly ‘healthy’ cooking had as yet to be ‘discovered’!! What a blast from the past! It might be a fun experiment to try to recreate this using ‘foodie’ friendly ingredients. Of course, it might lose some of its charm without the condensed soup! This dish definitely brings up memories. My mother made something very similar – I am going to forward this one to her! This dish has stirred up warm memories for plenty of commenters. I hope it does for your Mother, as well. Yes, that Graham Kerr was really something. I couldn’t help but laugh at his silly puns and antics. I do understand, having cut my hand on more cans than I care to remember. Why they haven’t all gone to “pull tops” is beyond me. My mom made a very similar tuna casserole, but no mayonnaise and canned mushrooms. Oh those wonderful canned mushrooms. 🙂 Gotta love this dish! I’ve been wondering for about an hour whether to comment on this recipe! I first learned about tuna casserole when I had just moved to Midland, Texas, and proceeded to have my 2nd baby within a week. A new neighbor of ours was nice enough to bring over this exact casserole, except that it had potato chips on it! I was so appalled, I refused to even taste it. It was the combination of the canned tuna, the can of soup, with which my Kansas-born husband was very familiar, and the potato chips. It’s just that my French mother really sheltered me all those years, in spite of us living in the US. She never opened a can, and probably didn’t know what potato chips even were! I’ve relaxed over the years, but have never used canned soup, and certainly never used potato chips in my cooking. That’s not a judgment, that’s just me. I love the sentimentality of your casserole, however. And that’s what’s important! You moved that close to your due date? Gosh, Mimi, you’re Wonder Woman! Considering how many foods Mom and Zia made from scratch, I’d be willing to bet she was drawn to this dish because it was so easy to prepare and would feed us all easily. Potato chips, though, was a bit too far for her to go. I must admit, I have never made a tuna casserole, but this is really appealing for a number of reasons. it is always a privilege when a family recipe is shared, I love the idea of adding noodles – another casserole first for me, I always have tinned tuna handy and finally, it looks very warming and comforting – perfect for the foul wintery weather we are experiencing. Thanks! Also, I greatly respect any recipe that survives as many technological obstacles as you’ve described here. This recipe rightly deserves a place in the Bartolini Kitchens Hall of Fame. Thank you, Ruth. I had forgotten all about this dish and finding the recipe was Divine Intervention. I prepared it as we were heading into the last Vortex and it was wonderful! Mom would have been proud! Ah, Melanie. I had my chance to move to France but said, “Non”. I considered moving to Italy — and said, “No.” I love my city and home. What wonderful comfort food, John, truly. I’ll have to swap out the mushroom elements if my older son – who would otherwise be all over this recipe – is going to try it, but that’s easily done I hope. Staying warm by the heat of your oven sounds like a pretty good deal, and that well stocked freezer is a blessing. Having enjoyed a particular chili or lentil soup a few too many times in a row recently, though, I know what you mean about wanting to mix things up. Thanks, Charlie. We get news report of your drought here, too. Earlier it was the extreme heat and the ever-present wildfires. And the poor Brits are getting soaked. We — Man — have really messed things up. Just this morning, they reported that Alaska’s average temperature was 15˚ warmer than normal for Winter and we’ve got another arctic blast hitting us over the next couple days. Yes, it has been cold, Celia, but I’m lucky that I needn’t go out in it if I don’t want to, unlike poor Celi. I don’t know how she does it. We had plenty of cheese in the house but bought it all from the Italian markets. I do not remember any of it being tinned. I’ll have to ask Zia about it. Canned brie? Oh, my! Bring on the gourmands with a big brass band fanfare John! roll on a return to (some) of the 60s and 70s recipes. You have reminded me my mum used to use condensed soups all the time – I remember creamy chicken and rice dishes which always started with a can of soup 🙂 Happy days and good warming tasty food. Nothing wrong in that! Marvelous recipe, John. IMO, this goes beyond comfort food into the realm of soul food. I like your mention of your freezer/fridge of leftovers. It might make a fun post for you to give us a peek inside some day! Thank you so much. I wish I had thought about taking a picture. For a wile, I placed leftovers inside my barbecue on the back porch. They all froze solid and kept well out there. Now that would have been the picture to snap! Now, unfortunately, it’s all clear. Thanks, BAM. The worrisome thing about the weather is that it’s not just us. California is having a severe drought. England and Italy are having plenty of rain with floods hitting some areas. Australia is, also, drought stricken. Meanwhile, the average temperature for Alaska this winter is 15˚ above normal. This is not good. Welcome back, Kathleen! Bronchitis is nothing to trifle with and I’m glad that you’re feeling better. If I lived closer, I would have brought you some of Mom’s soup. It always worked for us. I hope you’re back to 100% real soon. You are blessed not just with a loving mom but a mom with amazing talent in the kitchen. Recipes that warm and comforts the heart . My mom always made Tuna casserole for Ash wednesday. I think I’ll do that this year. I’ve actually rediscovered mayonaisse after years of shunning it. My mom never put corn or peas in hers, and probably not cream cheese. And will come back another time to try the pizzaola – another thing my mom used to make. Love this site. For me, it’s great when a recipe is associated with a holiday or special day. For me, preparing the dish brings wonderful memories to mind. I hope you’ll find the same to be true. This recipe is very forgiving. Forget about the peas, corn, and even cream cheese. It’s still going to result in a dish of comfort food. I’m glad you enjoy my site. Thanks for visiting and taking the time to leave such a great comment. I looove a good retro tuna casserole. Usually make mine with rice though. Keen to try it with buttered noodles. I know my boys will love this (and so will I). Ohhhhhh. This brings me back to my childhood! I loved my mother’s tuna casserole (or ‘tuna mornay’ as we call it here in Aussieland). She often served it with pasta shells or rice, I used to devour every mouthful! You’ve made me want to revisit the recipe. Great post as always John, will try your version. I like the addition of the soup, that’s a new ingredient to me!